AVForums is a community that focuses on home entertainment, technology reviews, news, articles and discussion. 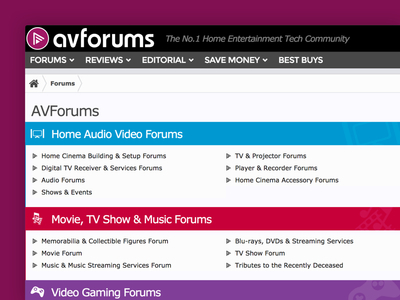 The client approached ThemeHouse wanting an updated and highly-custom forum design that could scale well the number of nodes they have. We decided to help differentiate categories with a flat-style color palette and unique icons.